Well, the time has arrived. The time to put all of that holiday planning into motion. Holiday parties are in full swing, which means gifts are being exchanged, conversation is merry... but also, tasty food and cocktails are being served at every turn. From gatherings full of finger food and cocktails to fancy sit-down dinners, to time around the family table, people are gathering. Unfortunately, not everybody knows where their next meal is coming from. Not everybody enjoys holiday parties and feasts. Not everybody. Though not the only group in need, there are seniors across our country who who not have meals were it not for Meals on Wheels. Meals on wheels provide seniors in America with more than 1 million meals a day. Food plays such an important role in our daily lives - yes, our bodies need it - but more than nourishing our bodies, it can also nourish our souls. Especially when enjoyed with a smile... in the company of friends and family... when it is made with love. 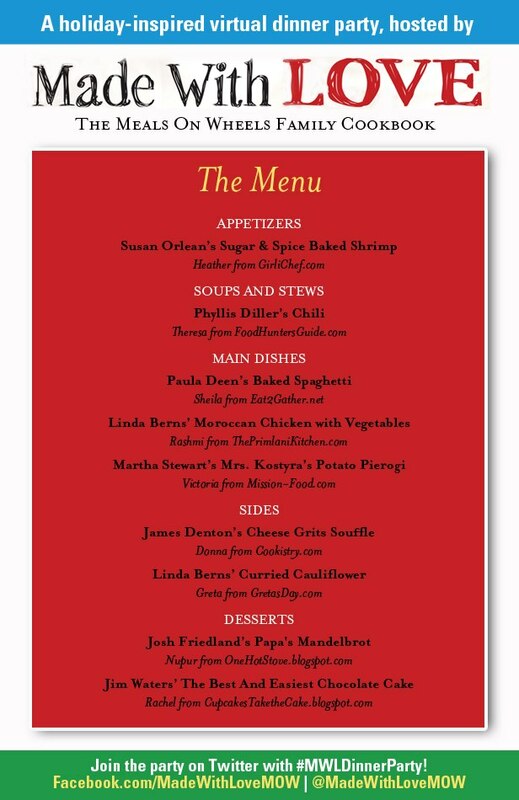 That's why, today, several days before Christmas, I am honored to join in a virtual dinner party hosted by Made With Love: The Meals on Wheels Family Cookbook. A group of bloggers is coming together with recipes from a book that raises money to help feed seniors in your community. Made With Love is a compilation of recipes and inspiring stories from all sorts of people, from recognizable names like Helen Mirren, Mario Batali, Paula Deen, Spike Mendelsohn, and First Lady Barbara Bush, to names that may not be as recognizable (but include food writers, NFL players, actors, governors, company heads, music producers, and musicians, to start). So in the spirit of giving and the holidays, I hope you'll consider helping end senior hunger by purchasing this book, donating, or helping out at your local Meals on Wheels chapter. 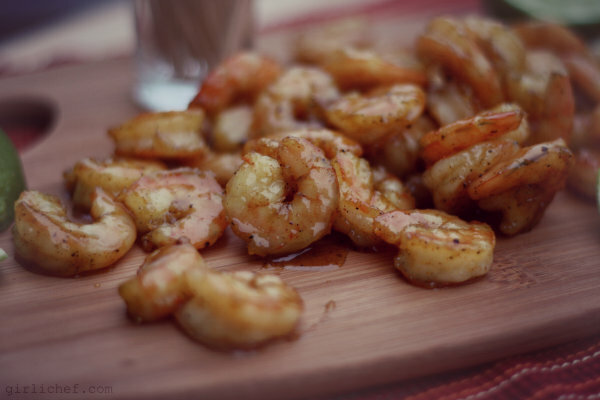 I'm bringing an appetizer to the party... a platter of ridiculously addictive, sticky shrimp that is both sweet and spicy at the same time. It would make the perfect appetizer or hors d'eouvre for any gathering. Preheat oven to 500° F. Grease a baking sheet with oil, or spray well with nonstick spray. Combine all ingredients except shrimp and lime in a large bowl; toss to combine. Dredge the shrimp in the sugar and spice mixture. Shake off excess and place on prepared baking sheet in a single layer. Slide tray into preheated oven and roast for 8-10 minutes, or until cooked through. Remove from oven and use a thin-bladed spatula to lift the shrimp and the caramelized juices from the tray onto a serving platter. 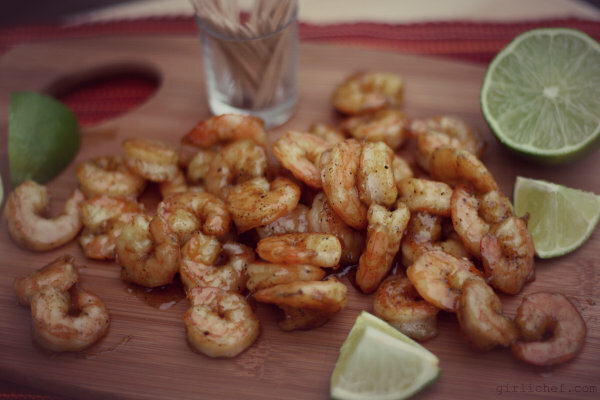 Squeeze a few lime wedges over the shrimp and serve immediately. Use any size shrimp you like, it's really up to your budget and your preference. Also, do yourself a favor and double or triple this recipe if you have a lot of people eating - these will disappear quickly! If doubling, you probably won't have to double the whole sugar and spice mixture. Just work quickly when dredging so that it doesn't clump up too much to become hard to work with. Click through to see tweets and links to the other recipes featured at the Made With Love Virtual Dinner Party! I received a free copy of this book. All thoughts and opinions stated in this post are my own. This post contains Amazon affiliate links.